Now for the giveaway! One lucky reader will win the budget friendly prizes listed above, please note, prints/styles will vary! Retail value approximately $200. Open to US residents, 18 and up. Void where prohibited. One entrant per household/IP address. Winner will be chosen randomly and will be emailed, they will have 48 hours to respond before a new winner is chosen. 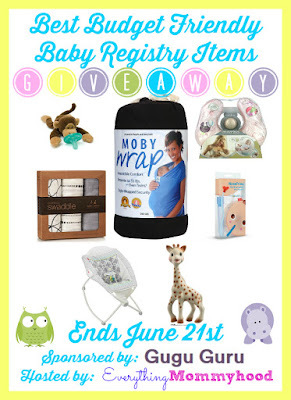 I would like the Moby Wrap in the prize giveaway the most. One of my must have baby items is a swing that rocks side to side rather than front to back.